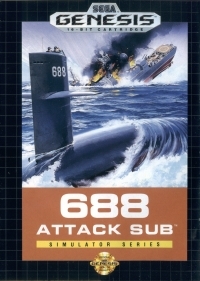 Box Text: You pilot the 688, a Los Angeles class attack submarine, tracking Soviet Alfa subs. Sonar reports a submerged contact - you load and arm your Mark 48 torpedoes, set a waypoint, and move in slowly for the kill! 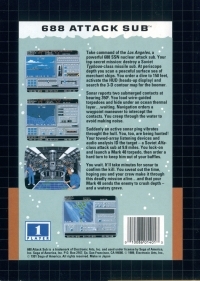 10-13-2012 exonerator Box Text You pilot the 688, a Los Angeles class attack submarine, tracking Soviet Alfa subs. Sonar reports a submerged contact - you load and arm your Mark 48 torpedoes, set a waypoint, and move in slowly for the kill! This is a list of VGCollect users who have 688 Attack Sub in their Collection. This is a list of VGCollect users who have 688 Attack Sub in their Sell List. This is a list of VGCollect users who have 688 Attack Sub in their Wish List.